Mélusine et "L'échappée belle du douzième siècle". Mélusine and the "L'échappée belle" (Happy Escape) of the 12th century. One may easily succumb to the charming appearance of the legend of Melusine; ie fall for its charm, if we understand charm in its contemporary sense as pleasing and agreeable, but not in its primary meaning as the power to cast a spell. In order to unravel the evil knot in which this legend has imprisoned itself, and us, two points of view are necessary: one historical, the other timeless and universal. First, we must place it in the cultural context of the first Renaissance, the one that took place in Christian Europe during the twelfth century, and which was characterized by the resurgence of a divine feminine, due mainly to the discovery of its “marvelous” Celtic pagan origins, in which such magical feminine figures, which we now call fairies, abound, and which the Church condemned as being tied to the devil – a condemnation which gradually lead in the following centuries to witch-hunting and put a brutal end to what was a first attempt at integrating the feminine, albeit one that was undertaken exclusively by men and which was altogether alien to the real demands of feminism. 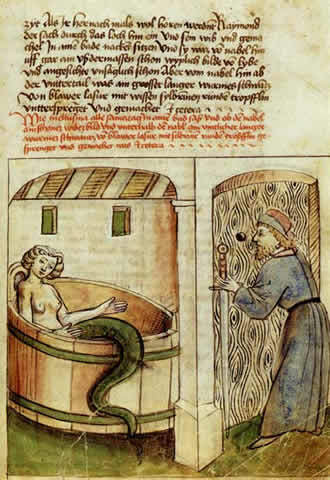 Secondly, it is necessary to compare the legend of Melusine with narratives found in regions far removed from the Christian sphere of influence but which have exactly the same structure and which also lead any attempt at a love union to failure, but without the absolute closure, the infinite distance or despair. It is by articulating these two fields of research that one can grasp more accurately the deceptively simple and charming legend of Melusine, and, through it, all the so-called fairy tales and stories one should qualify as narratives of failure: tales and legends of failure. 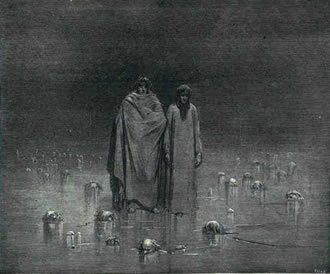 Nekyia - Les descentes aux Enfers. Nekyia est le mot grec pour descente, et spécifiquement pour la descente aux enfers. Aux enfers païens, bien sûr – plutôt froids – et convertis (religieusement) par le christianisme en enfers brûlants: les flammes éternelles avec lesquelles nous avons tous, ou du moins ma génération, été menacés dans notre enfance… Dans la bibliothèque de mon père il y avait les illustrations de Gustave Doré de la Divine Comédie de Dante (ci-contre), et notamment de la descente aux enfers, Inferno. C'était mon livre favori que je consultais en cachette – comme si on me l’avait spécifiquement interdit, pas certain; mais qui me fascinait et me faisait peur, certain.